19th March - 20th April. "Kumeu Arts Centre are thrilled to host an exhibition by Brent Wong. We are acclaiming an artist who jokes, “people probably think I’m dead,” as a renowned painter of our time. Wong came to the attention of the New Zealand art scene in the late 1960’s with work that can be commonly discussed as ‘surrealistic,’ however the artist describes his paintings as being more symbolic with personal intention. An almost distant figure to the art world, Wong has resurfaced for a show of Giclee prints from his core collection. Having abandoned painting 10 years ago with a divergence to composing music, these prints represent a preservation of Wong’s history as an influential New Zealand painter." Tuesday 26th February to Saturday 16th March. This exhibition will run much like a silent auction. Visitors will be able to ‘make an offer’ on each artwork in the exhibition by writing down their details and their bid. Artists will be notified at the end of exhibition what the highest bid (if any) was for their work and will choose to either accept or decline. The potential buyer will then be notified. 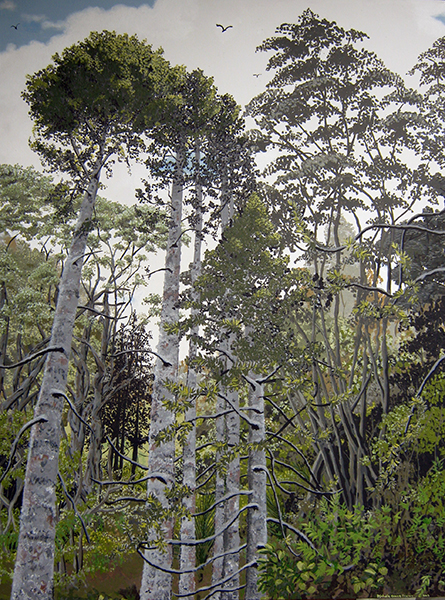 Opening event 4-6pm Saturday 26th January.Emerging artist Michele Grace Davies celebrates Kauri and other native trees in all their magnificent glory. Michele also aims to highlight the conservation of Kauri through this exhibition and says… “We have to protect this majestic tree of which many stories and legends are told, they are part of us, all peoples!”. This new year come and be awed by Michele’s vision and the beauty of creation.